The Love Caravanning melamine set consists of everything you need to dine out in style whilst on your camping or caravanning trip. 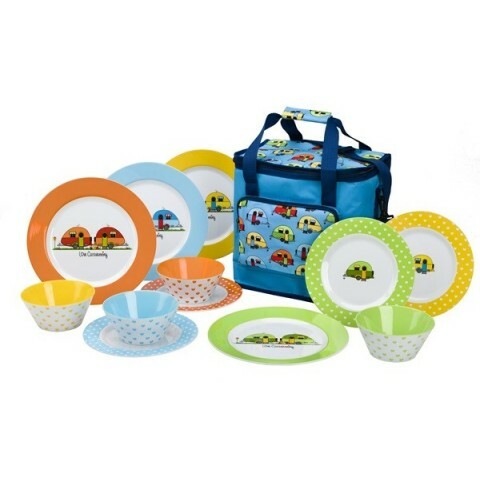 With 4 dinner plates, 4 side plates, 4 bowls and a 16L cool bag, you can feed the whole family with this useful set. The dining set is made from 100% melamine and is entirely break resistant and dishwasher safe, ensuring it is highly convenient for outdoor dining. With its vintage caravan inspired design, the set is of a high quality and is designed to last. The insulated cool bag is made from 100% polyester fabric with PEVA lining, allowing it to keep food fresh for up to 4 hours. Its generous 16L capacity also ensures it has enough space to carry food for all the family. The Love Caravanning melamine set consists of everything you need to dine out in style whilst on your camping or caravanning trip. With 4 dinner plates, 4 side plates, 4 bowls and a 16L cool bag, you can feed the whole family with this useful set. The dining set is made from 100% melamine and is entirely break resistant and dishwasher safe, ensuring it is highly convenient for outdoor dining. With its vintage caravan inspired design, the set is of a high quality and designed to last. The insulated cool bag is made from 100% polyester fabric with PEVA lining, allowing it to keep food fresh for up to 4 hours. Its generous 16L capacity also ensures it has enough space to carry food for all the family.